Hydronics simply means the use of fluid to transfer heat. The fluid usually used now is food-safe glycol. A boiler is used to heat it, then pumps and valves control, moderate, and move the hot/warm fluid to where it is needed; then the cooled fluid is circulated back for re-heating. The big benefits to hydronics are: the simplicity and efficiency of one central heat source, the comfort and flexibility this type of system gives you, and its quiet, unobtrusive operation. It is very easy to move heat precisely where you want it and to “zone” areas separately for different uses or comfort levels. Hydronics operates very quietly: unlike conventional furnaces which may hum and vibrate, you will rarely even know a quality hydronic heating is running (except by how cozy you feel!). For room heating, the fluid is pumped through pipes in the floors at a moderate temperature; large areas at warm temperatures make this type of heating incredibly stable and comfortable, without any cold-spots. If supplemental heat is needed, a “fan coil” replaces the conventional furnace. Instead of burners, a fan coil uses a radiator to heat the air. A fan coil will last almost indefinitely and is 100% efficient. Baseboard heaters and/or radiators using the hot fluid may also supplement this arrangement. Everything is tied into the one boiler, no electric baseboards or other secondary heat sources are needed. For domestic hot water (DWH), the conventional hot water tank is replaced by one without a burner; instead a heating coil inside the tank transfers boiler heat to the domestic water. These tanks have fast recovery times, and they keep their efficiency much longer because minerals do not burn onto the heat exchanger, outliving regular burner tanks by up to 4 times. Heating separate buildings from a single source via underground lines. Thaw lines along sewers and water pipes. Hot tubs (take hundreds of dollars off your yearly electric bill). Snow and ice melting for safety on important or problematic walkways and drives. 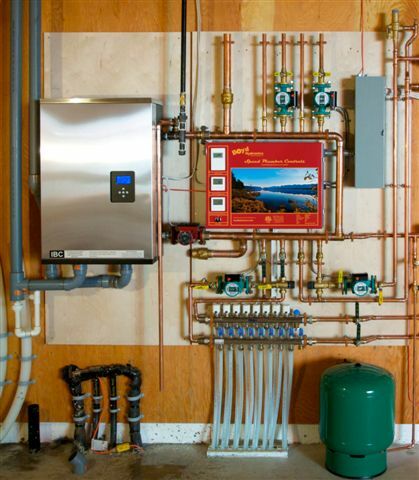 Simple integration of Solar or Geothermal collection when using Boyd Hydronics Systems. If you are thinking about hydronics, weigh out the following and consider what is most important to you. It is true that hydronics is the best type of heating system, but it is more involved to install and requires more materials, so it costs more up front than other systems. However, its long-term value and comfort are unparalleled. If your comfort is important to you and you have not experienced hydronic heating we recommend visiting a home or office that is heated hydronically, preferably in the most miserable weather possible. It is remarkable how different it is. Budget systems will require service calls more often because of reliability issues and shorter component life, and they are often “quirky” and don’t always perform well. Please do not consider any hydronic system that uses a hot water tank as a heat source. Hot water tanks are designed to make hot water which is 10 to 20% of a home’s heat load, they are not designed for the long duty cycles of home heating, nor are they capable of the heat recovery required. We have seen them work in a garage or shed where heating loads are small enough, but that is where they should stay. We all have budgets while building and that is OK; no matter what that budget is, spend it wisely. If you have a budget that allows for a good hydronicsystem, hydronics is the best choice; it will be money well spent and enjoyed for decades to come. We see how pleased people are with them. However, if your budget is such that you need to economize, it is better to install high efficiency forced air, which will be more reliable and easier to own than a budget hydronic system. Price a quality hydronic system and the alternatives and see what is right for you. Both in our controls and our Plug and Play systems, we make technology work for you; you don’t need to learn how to “dial in” your heating system. We pre-program our controls, so you have no frustration, no figuring things out, no wading through 85-page manuals. We have addressed the problems in communication between trades and simplified the installation, thereby cutting many hours of wasted time out of the final bill, and removing many of the mistakes that happen when there is misunderstanding. We also give you a higher quality product at a lower installed cost than can be achieved by building the system on site. 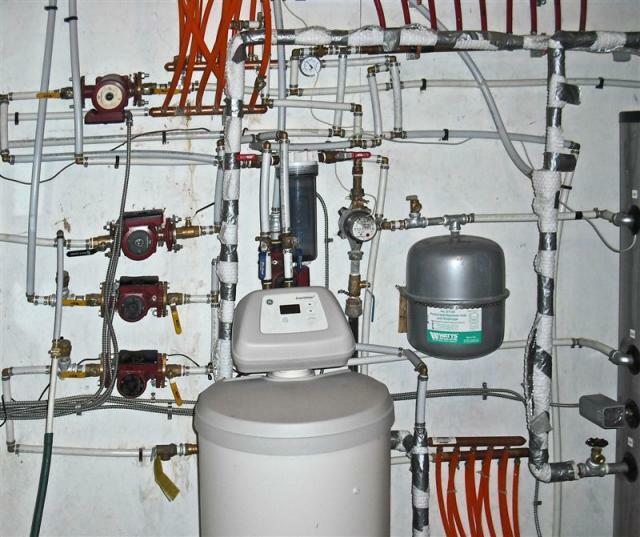 This concept of Plug and Play is new to hydronics, and in fact some plumbers resist it at first. The principle is easy enough: we assemble the whole unit in a clean place with all parts at hand using a proven design and all the right skilled trades repeating their jobs over and over with high efficiency. Rough-in the building to match the system, and it plugs right into the building. Using the same rough-in every time makes it easy for builders and installers. We build a quality product, designed from the ground up, utilizing the best components for the price from many big name manufacturers like Caleffi, Grundfoss, Taco, Watts, Webstone and others. We do this because no one brand does everything the best; we choose the best from each. Traditionally your general contractor will sub out your heating system. Most builders don’t know about Boyd’s Plug & Play hydronics yet but really appreciate finding out, as it benefits them too, so feel free to tell them about us and direct them to this site for more information. Some builders have had bad experiences with hydronics so we address those issues on the “Builders and Plumbers” page in the Members’ section. We make it easier to install better hydronics. Remember, it is your house and you have the final say about what goes in it. It is important: to note that if your plumber tells you he can build a system cheaper, yes he can, just look at the picture above. It will not contain the same quality of components, and likely not run well. The fact is, a plumber is not able to build a comparable quality product on site without sacrificing his profits, no more than a mechanic can build a car economically. We are a complete service company, from planning stamped drawings, manuals, and installation. plus you are buying factory direct which saves time money and the middleman that is clueless when you ask a question. Presently full systems are sold only to qualified trades for proper installation. Enjoy our site and the comfort of hydronic heating. Picture the scene. You wake up on the first day of your holiday, pull back the curtain, open the bi-folding doors and look out to the sea or the pool. Sounds great doesn’t it! This is certainly a scenario many hotel owners across the world want to make a reality as more and more hotel rooms now feature bi-folding doors instead of patio doors. Bi-folding doors offer something a little different and for 5* hotels provide that additional wow factor of uninterrupted views from the bedroom, out to some of the world most amazing locations, like New York City skylines. So why have they become so popular? Well for starters they look great. Aluminium bi-folding doors in particular offer a real focal point to a building. Due to the strength of aluminium and its stability, bi-folding doors can be built with smaller frames and thinner sightlines so you can maximise the amount of window in every open space. In turn this then maximises the amount of glass which means that not only can you get more natural light into buildings, helping holiday-goers feel refreshed and energised whilst they are away, but also these amazing views. It also can also help to reduce sound pollution, perfect for busy hotel envrionments. Bi-folding doors also offer lots of variations and are incredibly secure. This makes them perfect for hotel environments where people want to make sure all their items are left securely in hotel rooms whilst they are out on day trips, down by the pool or at the beach. Some of the most recognisable hotels in the world belonging to the Hilton group, Emirates and Grosvenor House in Dubai all feature bi-folding doors on multiple floors and levels to allow them to maximise eating, drinking and dancing space. Another huge benefits for hotel staff is that they can help to regulate temperatures inside whit the help of these doors. High efficiency glazing which often comes as standard with this type uses specialist technology to ensure that internal temperatures are cooler in the summer and warmer in the winter. Most people go on holiday to either get some sun and heat, or for the snow and thus ensuring the internal temperature is the opposite from outside is vital for these hotels. The same energy will also see them reduce energy bills, so that the hotel do not have to charge so much money for you to stay there. It is a win-win situation all round. So the next time you go on holiday, instead of just opening the doors and looking out to sea, why not think about why that hotel has those doors. Have they got them to save costs, provide you with a better experience or a something else? You never know you may well be opening up a luxury aluminium bi-folding door which provides for all scenarios. Hopefully it will give you the start to your holiday that you so desire! There are many benefits of installing water tanks on your property. The advantages that come with rain water tanks has seen many home owners consider them, with benefits including reduction of water consumption bills and increased property value. With a wide range of tank options to choose from, finding water tanks that directly suit your property has never been easier. If you’ve been considering installing your own water tanks, here are some of the benefits you can enjoy. Collecting and storing your own rain water with water tanks allows you to dramatically and effectively cut down the cost of your water bill. When running a home, the amount of water you use can be one of your biggest expenses, and water bills can become quite costly when water usage isn’t properly managed. With water tanks, you’ll have access to free water that you can utilise for things like gardening, washing your car, daily household chores and much more, without impacting the cost of your water bill. While some of the initial installation requirements of water tanks may seem costly, you’ll be saving large amounts in the long-term. With water shortages and droughts occurring more often as a result of climate change and harsh weather conditions, there are often water restrictions put into place to ensure people aren’t using too much water. However, water tanks solve the problem of having to be careful with your water, providing a convenient way to continue accessing it frequently. Rather than having to limit your usage of water from the tap, you can catch rain water and use it instead. This means you won’t have to reduce your shower time or limit your water usage for other purposes. Water tanks can dramatically improve the overall value of your home or property. With the demand for water tanks only continuing to grow, more homeowners and buyers are seeking properties that have water tanks. Installed water tanks, particularly those that are functional and sustainable, are highly valued for buyers in both rural and metro areas for the many advantages they bring. The many different styles of water tanks available also means that water tanks don’t necessarily have to take up too much space or detract from the aesthetic appeal of your property. Water tanks are the best way to do your bit for the planet. Collecting and storing water that would have otherwise gone to waste is a hugely important part of contributing to a more sustainable planet. Water tanks successfully collect rain water that would have originally became “run-off” water and gone unused. With water tanks, homeowners can find ways to use water in the best way possible without contributing to the ongoing issue of water shortage. It also means that you won’t have to feel guilty carrying out everyday tasks that require water, as you’ll have collected it yourself. If you’re looking for a fun and cheap way to spice up your interior, the following three easy DIY projects are perfect for you! These fun do it your self projects show you how to turn leftover tins and metal tin containers into beautiful decoration for at home. Are you looking for that one perfect desk light but are not able to find it anywhere? Well, why not make one yourself? All you need is a cheap five dollar lamp from any local store and an empty soup can. With the right tools and a little bit of creativity, you’ll be able to turn these two components easily into a stylish and modern table light that is sure to spice up your interior. The first thing you’ll have to do is get your old table light (or a cheap one you bought for this DIY project) and dismantle the wires and cut off its original shade. Be careful not do damage the stand of the light or the light bulb as we’ll still need these parts of the original lamp for our project. 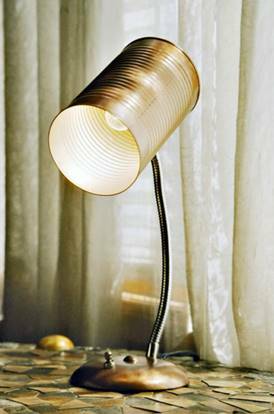 Once you have dismantled the original light shade, use it as a template to find out where to drill all the appropriate holes in your tin can. After this, use a piece of sandpaper to remove all the sharp edges of your tin can. This is important as we all know how sharp soup tins can be and you don’t want anybody to get hurt or cut by touching your new table light! After drilling all the holes and using the sandpaper to remove all sharp edges, it’s time to paint your lamp. It is advisable to use silver spray paint to color the inside of your tin can. This will help you to hide the seam of your can while simultaneously hiding any drill marks that accidentally occurred while making the holes. For the outside of the can, you can choose any color of your liking. Personally, I would advice taking an old and metallic color to add to the lamp’s industrial look. Put your lamp aside for a while and let the paint dry. Now that the paint is dry, you can reassemble your lamp. To do so, you will need some basic knowledge about how to wire a lamp. If you are not sure, you can always ask a friend or visit your local hardware store or handyman. They will be able to help you out in a couple of minutes. And there you are, you can call yourself the proud owner of your own can light! Simply plug it into the wall socket and switch on your new light. With its industrial look, this can light looks great among both modern and traditional household furniture. Once you have collected all the items you need, we’ll start off with preparing the tin containers. You can use any type of small metal container but personally I love to use a window tin. These metal tins come with a little window in the lid and thus allow you to see all the colorful spices inside. To prepare the tins, we need to make sure that they are completely free of oils and other dirt. Therefore, the first thing we do is give them a quick clean-up with a wet tissue and some soap. After this, you take your sand paper and roughen up the back (bottom) of your tins. This is necessary for the magnets to stick. Once you are done with this, give your tins a quick clean up with a wet towel again to remove the dust. Now, take your glue and carefully glue the magnets in place at the bottom of your window tins. Make sure that your glue sticks on aluminum as, in most cases, regular glue won’t do the trick. Once the magnets are in place, put your tins aside for several hours to let the glue dry. After your glue has dried and the magnets are firmly attached, you can label your tins. To do so you can use paper but I would advice you to use a label maker instead. If you don’t have a label maker or paper available, you can always use a waterproof marker and write onto your tins directly. 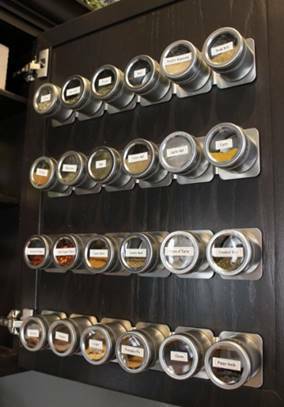 Once you have attached the labels, your individual spice tins are virtually done. Simply fill each tin up with the herb that matches the label and attach them to a steel surface. You could either stick them to your fridge door or hang then from a metal strip attached to your kitchen cabinet doors or wall. When filled up with different color herbs, these spice tins truly will add some color to your kitchen. One of the easiest yet one of my favorite DIY projects with empty tin containers is making candle tins. This little project is good for a day of fun and will treat you to some beautiful home made candles. The first thing you’ll have to do is fill up your old pot with water and heat it up by using the stove. In the meanwhile, place an inner pot or bowl over your main pot and let the boiling water heat it up. Once the water is boiling and the inner pot has been warned up, you can throw in the leftover candle wax. Be careful not to put everything at once. It’s a smart idea to make each candle one by one so only put in just enough wax to fill up a single tin. After the wax has become liquid, you can add the food coloring, glitters, and essential oils to add some extra flair to your candles. After this, let your wax boil for a little longer. Now, take your pot of the stove and let the wax cool down for just a minute. In the meanwhile grab a tin container and place a wick in the middle of the metal tin. Once done so, carefully fill up your tin with the candle wax. Be careful not to move the wick while doing so. After the tin has been filled up, you can use a pair of toothpicks or chopsticks to hold the wick in place while the wax hardens. After the candle hardened, get your scissors and cut off the wick at the right length. While you are waiting for your first candle to harden, you can repeat the steps above to make other candles. You can either make the same candle or experiment with different colors and smells. And there you have it! 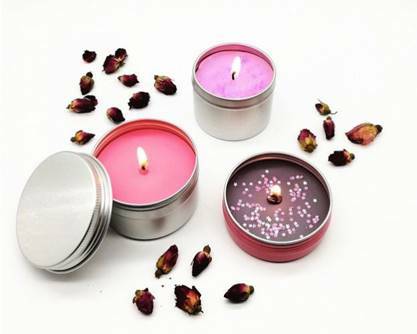 Your own home made candle tins. These little beauties are fun to make and look cool in any modern household. And what’s best is that you can burn them and enjoy the wonderful smell and colors of your home made candles. What is Industry 4.0? This is a very good question, and it’s one that many business owners are currently asking. But to understand what Industry 4.0 is, it’s important to first understand the industries that preceded it. There have been three previous industrial revolutions – the first industrial revolution (also known simply as the industrial revolution), the second industrial revolution, and the third industrial revolution. Each of these revolutions has played a part in leading up to the current Industry 4.0, so it makes sense to examine these in a little more detail before looking at Industry 4.0. Beginning around 250 years ago, the first industrial revolution marked the first time in history where humans were replaced by machines. This was made possible with the technological advancements that came as a result of steam power being used. The second industrial revolution was characterised by great advancements in a number of areas such as electricity. This revolution saw the introduction of the mass production assembly line in factories. The third industrial revolution saw the arrival of complicated computer technology and sophisticated electronics. Humans were replaced on production lies by machines capable of performing automated production tasks. It’s clear to see that as each industry progresses, humans are being replaced by machines as jobs become automated. This is both a good and a bad thing simultaneously. Nobody wants to lose their job or see others without work, but at the same time, technology will continue to advance no matter what – and new jobs in other areas will be created as a result of advancements. Industry 4.0, or the fourth industrial revolution as it is also known, is the industrial revolution we are currently in the midst of. It is essentially the era where computers and automation are coming together in a way that’s never been seen before. Industry 4.0 incorporates the internet of things, digital technologies, big data cloud computing and artificial intelligence into factory systems, meaning intelligent production will soon become a reality. One of the main things to come out of Industry 4.0 will be the ‘smart factory’. A smart factory is in essence a place where cyber physical systems will monitor physical processes, meaning that the factory’s computer system will have the ability to make intelligent and informed decentralised decisions with minimal input. An Industry 4.0 factory will possess a number of qualities, including the ability to make informed decentralised decisions, solve problems and support humans in decision making processes, communicate with people, machines, sensors, actuators and other devices, and also incorporate the internet of things. While Industry 4.0 presents its own set of challenges, just like the industrial revolutions that came before it, it’s clearly a logical progression that will bring with it a wide range of benefits. By utilising cloud computing, the internet of things, artificial intelligence and big data, intelligent production may one day become a reality. Posted byadmin March 17, 2018 March 26, 2019 Posted inIndustrial SolutionLeave a comment on What Is Industry 4.0? Not all construction materials are the same. They look different from each other and they also have different properties. You need to be familiar with the characteristics of each material, so you can find one that perfectly fits your goal. This should not be a priority when determining what construction materials to use, but it is one of the considerations. You don’t want to make a decision solely on the price, but you want materials that are affordable enough. The same material may also vary in price depending on where you buy it and what brand you choose. Sometimes, cheap materials also have lower quality. They are prone to damage. Hence, you end up spending more for maintenance and repair. On the other hand, there are stores selling good quality cheap building materials that you might also want to consider. You need to consider where these materials will be used. Some of them are not meant for heavy rain while others are not going to last under intense heat. Check local building codes and regulations to determine what materials are more suitable for your location. Find suppliers that provide high-quality materials only. Read reviews online or look for recommendations from people you know. When the supplier has a solid reputation, you can be certain that anything you buy from them will last for a long time. You want to have the materials needed for construction available right away. You don’t want to waste time waiting for imported goods when there are local counterparts. You will just end up spending more if you decide to wait until those materials arrive. If you have a contract with the people building the structure and they have to wait without any progress, you will still keep on paying them. You might also want to take a look at high-quality materials that are considered surplus. They are the same top-quality items that were excess from previous construction work done. They are sold at a much lower price. Just make sure they are from quality manufacturers as well. Seek advice from experts on what materials to use. Speak with your contractor in advance so you can make a decision together. Sometimes, we tend to be too focused on the aesthetic appeal of the material that we forget all other factors. Your contractor will remind you of these important qualities. Once you have found the right material, double check the price and compare it with other sources. Unless you are certain that you are getting the right materials, keep searching. Read reviews to get a better understanding of the various materials.